Big Goals Can Backfire. Olympians Show Us What to Focus on Instead. At the United States Track and Field Olympic Team Trials in Eugene, Oregon, 28-year-old Brenda Martinez was in prime position to win her best event, the 800-meter run, which would qualify her for the Olympics for the very first time. But with less than 100 meters to go, a trailing runner tripped and fell forward into Martinez, throwing her off balance. She was able to regain her footing, but not before being passed by a handful of other runners who would secure the three Olympic spots. It was devastating to watch. And move forward she did. Less than one week later, in the 1500 meters, Martinez literally dove across the finish line to secure third place — by three one-hundredths of a second — earning her the opportunity to represent the United States in Rio. Brenda Martinez wasn’t attached to her goal of making the Olympic team. She was focused on the process. Another problem with goals, especially those that New York Times best-selling author Jim Collins calls “big hairy audacious goals” (or “BHAGs”), is that they can seem overwhelming and amorphous. For example, a goal of finishing an Ironman triathlon is motivating until you realize how hard it is to do and that you have no idea where to start. And even if you do figure out where to start, you quickly grasp how far you have to go — both figuratively and literally. Any acute progress seems trivial. Ironically, focusing on such a goal can demoralize, demotivate, and, ultimately, detach you from the steps you need to take today to accomplish it. Still, let’s say you persist and accomplish your big, hairy, and audacious goal. If that’s all that you were focusing on, what happens next? Some people feel a void in their life, becoming saddened and even depressed — what marathon runners often experience as the “post-race blues.” Others, meanwhile, fall victim to what author Gretchen Rubin calls the “danger of the finish line”: Once you accomplish your goal, you drop the good habits that got you there. (A common example of this is yo-yo dieting.) Both of these outcomes are related to a goalcentric approach — and neither is desirable. But perhaps the biggest potential pitfall of concentrating too much on goals is this: It often ties your self-worth to things that you cannot control. Imagine that unprecedented weather conditions strike on race day, preventing you from finishing your Ironman triathlon. Or that the boss who was going to promote you becomes ill and retires. Or that you write what you believe to be the perfect manuscript, but the publishing house feels differently. Do these events make you a failure? If you judge yourself based on whether or not you accomplished your goal, then, unfortunately, the answer is yes. Becoming a slave to the achievement of a specific goal creates a volatile and fragile sense of self. This isn’t to say that you should completely disregard goals. Goal setting can serve as an effective steering mechanism, a north star to shoot for. But after you set a goal, it’s best to shift your focus from the goal itself to the process that gives you the best chance of achieving it; and to judge yourself based on how well you execute that process. Focusing on the process means breaking down a goal into its component parts and concentrating on those parts. It’s an incredible focusing mechanism that keeps you in the here and now, even during the pursuit of distant goals. 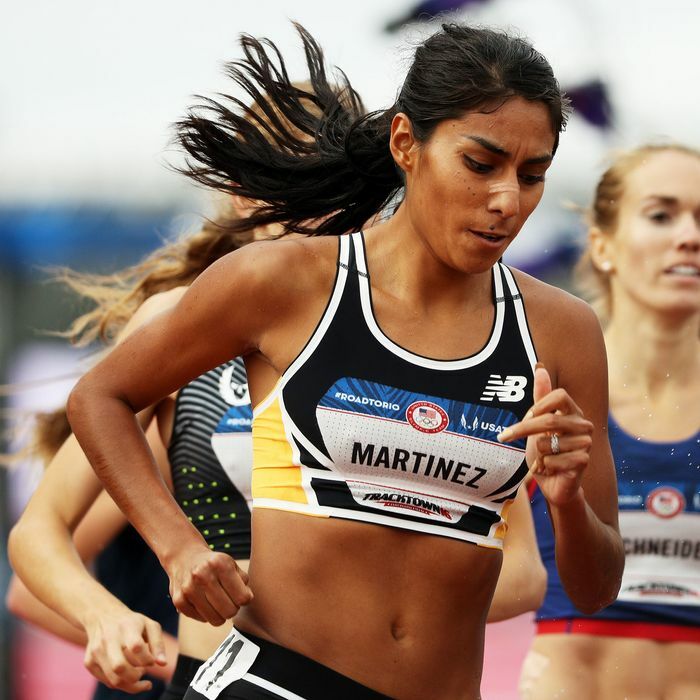 For Martinez, this meant not worrying about her bad luck in the 800m, but rather ensuring she got in the right nutrition, bodywork, sleep, and workouts to give herself the best chance of running a good race in the 1500m. Again: She wasn’t focused on making the Olympics. She was focused on the process of making the Olympics. This mind-set can be applied to any goal — from qualifying for the Olympics, to earning a promotion in the workplace, to improving a relationship: First, set a goal. Next, figure out the steps to achieving that goal that are within your control. Then — (mostly) forget about the goal, and focus on nailing the steps instead. A process mind-set creates daily opportunities for little victories, which help sustain the motivation required to accomplish long-term goals. A handful of studies, including one in the prestigious journal Nature, provide insight into why this is the case. Researchers have found that when mice accomplish micro objectives on the path to distant goals (e.g., making a correct turn in a maze), their bodies release dopamine, the neurochemical associated with motivation and drive. Without hits of dopamine, the mice become apathetic and give up. Although these studies cannot be safely replicated in humans, scientists speculate we operate the same way. Process promotes progress, and progress, on a neurochemical level, primes us topersist. Even more important than what it does for our motivation, focusing on the process cultivates what University of Quebec psychology professor Robert J. Vallerand calls “harmonious passion.” Harmonious passion is characterized by a deep intrinsic motivation, a love for doing the work involved in achieving a goal. It’s the opposite of what Vallerand refers to as “obsessive passion,” or being motivated by and attached to the external recognition that achieving a goal might bring. Harmonious passion is embracing and relishing in the process of getting better at a given pursuit. Obsessive passion is becoming a slave to the achievement of goals for achievement’s sake. Vallerand has shown that while the latter is linked to burnout, anxiety, dissatisfaction, and depression, the former is linked to long-term performance, well-being, and fulfillment. Cuddy says that this mind-set lends itself to presence, which she defines as the ability to be in the moment, confident but not arrogant. When it comes to achieving your goals, perhaps it is this kind of presence, fostered through process, and embodied by Brenda Martinez, that is the most critical asset ofall. Brad Stulberg is a columnist for Outside Magazine, where he writes about health and the science of human performance. Follow him on Twitter@Bstulberg.